Critics accuse US Secretary of State John Kerry and Iranian Foreign Minister Mohammad Javad Zarif of having sealed a nuclear deal on Tuesday that will lead to a regional nuclear arms race in the Middle East - but the two may be on their way to winning a Nobel Peace Prize. The Stockholm International Peace Research Institute (SIPRI), a leading Swedish think-tank, has recommended Kerry and Zarif for the 2016 Nobel Peace Prize for their leading roles in the nuclear deal, reports the International Business Times on Wednesday. Tariq Rauf, director of SIPRI's Disarmament and Non-Proliferation Program and formerly chief of Verification and Security Policy at the UN International Atomic Energy Agency (IAEA) from 2002 to 2011, said the two deserved a Nobel prize. He called the Iran nuclear deal the "single-most important multilateral agreement in decades," comparing it to the 1996 Comprehensive Test-Ban Treaty (CTBT) on nuclear detonation testing - critics have compared the new deal to a similar one reached with North Korea in 1994, which around a decade later enabled the Communist regime to obtain nuclear weapons. Despite the talk of a peace prize for Kerry and Zarif, the two in fact have shown signs of a severe lack of "peace" between them. Last week Zarif intensely shouted at Kerry to the point that his shouts could be heard throughout the ritzy Palais Coburg in Vienna where talks were held, thereby ignoring Iranian Supreme Leader Ayatollah Ali Khamenei's instructions not to shout at Kerry that were given after a number of previous outbursts. 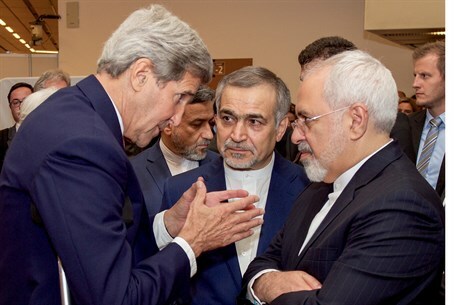 Among other things, Zarif angrily screamed at Kerry to "never threaten an Iranian!" As surprising as the nomination may be given the concern over the deal - particularly in Israel and the Gulf states where warnings of a regional nuclear arms race have been heard - it would hardly be the first controversial Nobel Peace Prize. US President Barack Obama won the award in 2009 after less than a year in office, and before having taken any concrete steps in his post that would have possibly warranted the more than $1 million prize. "I accept this honor with gratitude and humility," Obama said at the presentation ceremony, while admitting: "I have no clear solutions to conflicts around the world." A survey by the Norwegian University of Kinifk conducted at the time found only 26% of Americans thought Obama deserved to win. Perhaps even more controversial was the prize awarded to Yasser Arafat, the founder of the Palestine Liberation Organization (PLO) and an arch-terrorist responsible for the murder of hundreds of Israelis, who was given the prize together with then-Prime Minister Yitzhak Rabin after the 1993 Oslo Accords.